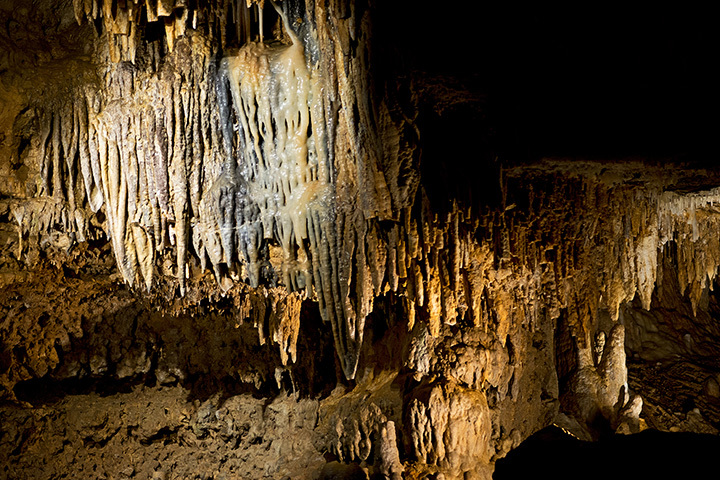 Visit Wisconsin’s most prized cave attraction located near Blue Mounds, WI. Guided tours happen daily and are year-round. Paved walk ways with great lighting and a comfortable constant 50-degree temperature make it a huge family hit. Check out the spectacular crystalized rock formations throughout the meandering caves at the Cave of the Mounds. The town of Spring Valley holds the beautiful Crystal Caves discovered in the late 1800’s. Learn hands on about speleothems, mineralization, fossils, history behind the caves, and other rock formations. Cave Point County Park caves aren’t your typical above ground caves and is often missed because it is a county park rather than a state park. The park is famous in Wisconsin for their limestone cliffs which dive down deep in their underwater caves. Those skilled enough to do so can scuba dive into the picturesque county park caves. Eagles Cave is Wisconsin’s largest onyx cave located in Richland County. Guided tours of the cave happen from Memorial Day to Labor Day with an extended Cave Exploratory Programs that runs September to April. Check out for yourself the beauty of Eagles Cave in Blue River. Specifically New Hope Cave at Cherney Maribel Caves Park brings in a ton of foot traffic every year. Tours are by appointment and on weekends from the volunteer guides at the park. Remember to bring your flashlight, and old pair of shoes, and clothes that you don’t mind getting dirty!